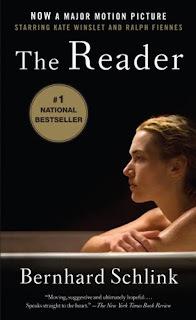 The Broke and the Bookish : Kelly's Review of "The Reader"
This sounds kind of fantastic! Thanks for the review. I've read this. It was good. I saw the movie but haven't read the book. You mention not seeing a movie until you've read the book and with Twilight, I'm doing just the opposite, first I watch the movie then read it. I liked the movie, The Reader, but I understand what you mean about only wanting to read it once. I got more than enough watching the film and don't think I'll read the book. Based on your review, it sounds like the film stayed pretty faithful to the story. Thanks. I'm following you now. I saw this movie and I thought it was alright! Kelly, I haven't read the book (or seen the movie) but I think you did the book justice! I've seen a lot of summaries about the book that emphasize certain elements over others, and you did a great job covering the important bits without giving too much away. Yeah, it does seem like one of those books that you'd read once but not again. It's not exactly the cheeriest novel to have on your favorites shelf! I have never heard of this movie or the movie. Glad you find this one and enjoyed it. I loved this book (and the movie! ), and I'm hopping on by via the Book Blogger Hop. Thanks guys! It was such a small book and VERY easy to read. I think I will watch the movie sometime, I mean Kate Winslet did win an Oscar for her role as Hanna!